Faced with several hundred drum-beating, dancing and chanting demonstrators who refused to leave the state Capitol after the doors were shut at 4 p.m. Sunday, police decided to let the crowd spend the night and continue the protest against Gov. Scott Walker’s budget-repair bill. It was unclear how long the protesters might be able to maintain their nightly vigil. The policy will be reviewed, Tubbs said. The state’s Department of Administration had sought to bring a sense of business-as-usual to the Capitol by establishing regular hours. Officials said they were trying to clean the building after nearly two weeks of continuous protests. Tubbs announced the decision to let the protesters stay after he saw how they moved aside while work crews went about cleaning the Capitol, including mopping and polishing floors. It was yet another surreal moment in the continuing saga of political chaos at the Capitol. “We delivered a message to Gov. Walker. We’ll continue to be here to kill this bill,” said Peter Rickman, 28, of Neenah, during a news conference held shortly before the doors shut. Protesters said they were prepared to be peacefully arrested to make their point that the Capitol should remain open. * Visitors to the Capitol will enter only at the King St. entrance. * Visitors will be admitted to meet with legislators and other officials, to attend committee hearings and to observe the state Assembly and Senate if they are in session. * Protesters will be allowed in the building, but crowd size will be adjusted to accommodate the cleaning crews, the preparation for Tuesday’s joint legislative session and the number of protesters who remained in the building. * Police will continue the practice, begun on Saturday, of disallowing sleeping bags, blankets and animals (other than service animals) into the building. Thursday, February 24, 2011 11:59 p.m. Updated Friday, February 25, 2011 1:59:55 a.m.
Republicans resorted to a surprise vote at 1:09 a.m. Friday morning to pass the governor’s controversial budget repair bill as Democrats leapt out of their chairs shouting “Shame! Shame!” at the exiting representatives. Republicans had attempted the quick vote at least two other times earlier in the night, but Democrats, under the vocal leadership of Rep. Peter Barca, D-Kenosha, protested and demanded the speaker renounce the votes. The move came after around 61 hours of debate had taken place, largely due to Democrats taking liberty with the length of their speeches. The final count of the vote was 51-17. Gov. Scott Walker introduced the bill two weeks ago today to address the $137 million budget shortfall. It contained provisions that would provide more executive control over medical assistance, increase state worker contributions to their pensions and health care premiums and severely limit public union members’ rights to collectively bargain. Union leadership protesting around the Capitol and observing the rallies from across the state over the past two weeks have said they would accept the budget bill provision requiring them to pay more toward pensions and health care premiums, but would not accept losing collective bargaining rights for work conditions and benefits. “Unions agreed to pay. It’s obvious this isn’t about money. This is about union busting plain and simple,” Rep. Christina Sinicki, D-Milwaukee, said. We’ve interviewed former senior CIA analyst Ray McGovern, on the air and off, many times over the years. We’ve come to consider him not just a source, but a friend and a national hero for his tirelessly non-partisan fight for truth and justice. The man who once briefed Presidents directly, from Ronald Reagan to Bill Clinton, had long ago earned our great respect — from his courageousness in famously confronting then-SecDef Don Rumsfeld in 2006 about lying about Saddam and WMD (watch the classic confrontation on video here) to his calling out CNN on air for their abysmal failures in accurately reporting on WikiLeaks (video here) last December to his arrest weeks later at the White House with other vets and national heroes for “refusal to obey a lawful order” while protesting against the Obama Administration’s wars around the world — all while overcoming some enormous personal health issues at the same time. New polling conducted for the AFL-CIO and shared with The Huffington Post shows Wisconsin voters siding with the state workers, unions and protestors by large majorities and expressing net disapproval of Republican Governor Scott Walker. In this case, however, the ratings of Walker and his budget and collective bargaining proposal are roughly comparable to an automated survey conducted in Wisconsin last week by WeAskAmerica, a for-profit subsidiary of Illinois Manufacturer’s Association (an organization that has endorsed Republican candidates for state office in Illinois). Editor’s note: The following excerpt from Robert Scheer’s book “The Great American Stickup” details the perversion of Fannie Mae and Freddie Mac. This is especially relevant given news that the Obama administration is abandoning those institutions, as explained in Scheer’s column here. That chorus of the nineteenth-century Cockney ditty “She Was Poor But She Was Honest,” detailing the travails of a poor lass whose life is ruined by the deflowering advances of a rich man, best captures the mainstream Republican response to the banking meltdown. Their defense has been to blame “bleeding-heart” liberals concerned for the poor for a debacle that occurred unmistakably on their watch, and in response to their antiregulatory ideology, but for which they shuddered to take responsibility. There’s a lesson to be learned, Truthseekers, from our former countrymen in Great Britain. The media here isn’t covering this, for obvious reasons, but England is experiencing a very different kind of Tea Party uprising and we would do well to take notice. Unlike the bizarro backward movement here, where otherwise normal Americans are taking to the streets to protest policies that would further cut their wages, benefits, health care coverage, and public services they rely upon, in England the protests are against (gasp!) the corporations and pro-corporate government policies that are ravaging their economy. Now, doesn’t it make more sense to speak out against tax-evading Big Corporations who have created the recession than attack the very progressive policies that attempt to improve our standard of living? Johann Hari thinks so, and that is the topic of his very thoughtful, very important article How to Build a Progressive Tea Party, which appears in the current issue of The Nation magazine. Please read it. 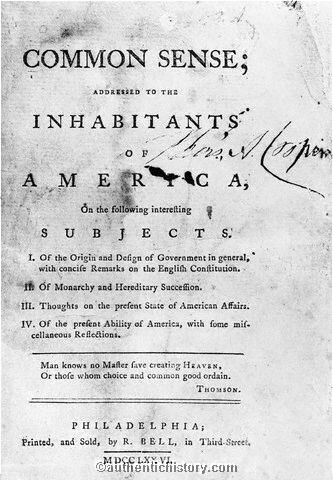 In light of President’s Day, Thomas Paine couldn’t have said it better himself. 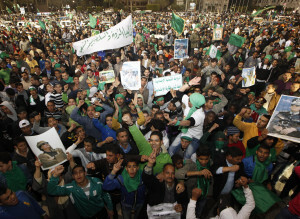 Let’s play a little catchup on the two most deadly flashpoints in the Arab uprising right now. In Bahrain, scene of a dastardly attack on protesters while they slept in Pearl Square, the attempt at repression backfired almost immediately. The Shiite al-Wafiq movement left the Parliament and demanded the resignation of the government. Protests grew in size. Sen. Patrick Leahy called for the application of a law he wrote to deny aid to Bahrain for violating human rights. And the protesters took back the square, with police and the Army withdrawing. Bahrain’s Sunni Muslim ruling family came under increased pressure to open in-depth negotiations with the Shiite-led opposition, as protesters erected more tents on the capital’s Pearl Square. Dozens of workers also joined the protesters, and more than 1,000 medics marched on the square to demand the resignation of the health minister, whom they accused of slowing aid to protesters during a deadly police crackdown. After nightfall, an AFP correspondent reported thousands more people converging on the roundabout, which has been the focal point of demonstrations that have rocked the small but strategic Gulf kingdom since February 14. The opposition has also called a large protest for Tuesday afternoon in the hope that tens of thousands of people will converge on Pearl Square, according to the INAA, Bahrain’s main Shiite opposition group. Crown Prince Salman, the heir to the throne in Bahrain, is supposed to be leading reconciliation talks. Bahrain has a Sunni minority in power over a Shiite majority, with predictable results. This is a really good backgrounder from Foreign Policy. In an epic example of bad timing, the State Department praised Bahrain just a few months ago for its movement toward democracy. Then there’s Libya, where it’s hard to really get a full picture, with most foreign media unable to enter the country. We know there has been a massacre; the extent is not well known. Moammar Gadhafi’s son went on state-run television and vowed to “fight until the last man, the last woman, the last bullet.” He gave a long, rambling address, blaming Islamists for the provocation, saying that the country was on the brink of civil war, which threatened their oil output and risked colonization by an invading force, summoning up images of Iraq. Protesters have apparently taken control of Benghazi, the country’s second-largest city, and were clashing with police in the capital of Tripoli.